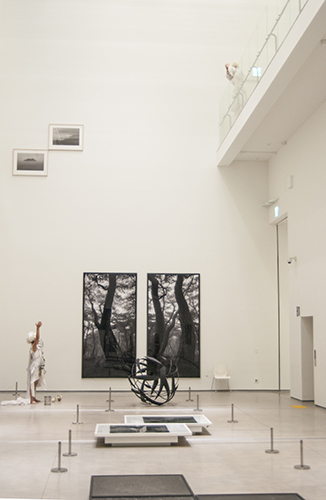 Through the aural and visual act of the procession, Spectral Rite explores the architectural condition and the institutional environment of MMCA Seoul. Berlin-based performance duo HYENAZ incarnate as androgynous celestial beings, beautiful monsters, hybrid street peddlers and warriors for justice. Their presence evokes remote yet acquainted spaces in East and West, archaic and future tenses, as they appear within the MMCA as familiar strangers. 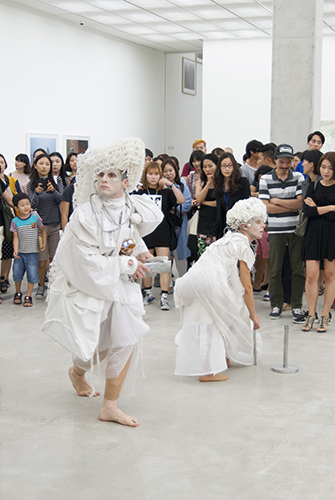 The procession is guided by an analytic approach to the architecture of MMCA Seoul, and implies contemplations around the destiny of a space which could rupture into another field of parallel time that is both history and future. Embodying the primitivism of the procession, Spectral Rite configures an idealist sphere within the architecture of the museum born from a critical vision of reality. The museum will become a space of hospitality towards social and political outsiders, with the intention of pushing back against a schizophrenic, neoliberalist conservatism that apparently encroaches on our current globe. HYENAZ will present four musical compositions with lyrics in Korean exclusively composed for Spectral Rite. Each station in the procession is connected by movement transitions and atmospherically sung language. 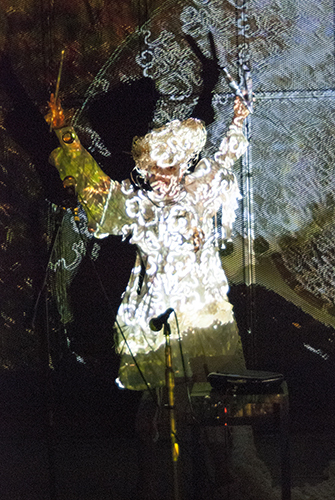 Reacting to the condition of mobility during the procession, the geometry of each costume is embedded with a variety of inventive solutions for acoustic and digital sound experimentation. The pseudo-instruments recall shamanistic tools, weapons of war, futuristic media machines and recognizably mimic existing instruments. In Spectral Rite, the voice suggests a pre-linguistic phase of sound, and attempts to overcome language-centered systems as well as the impossibility of translation. 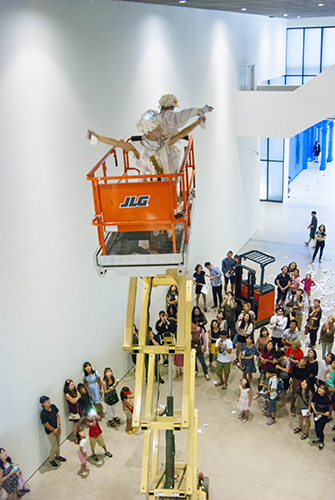 The movement visualizes a yearning for a unified hybrid of gender, histories and spaces. 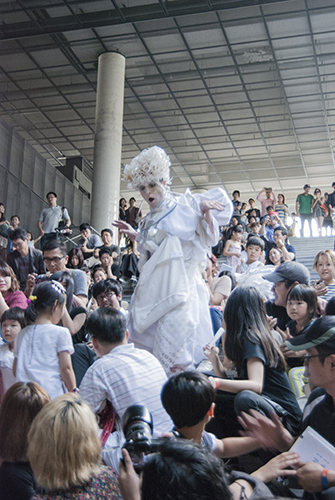 Spectral Rite is a wedding of physical bodies and the architecture of the museum. As warriors, HYENAZ intend to prevail over apathy and daily complacency of consumerist and institutionalized city life. Introducing the sense of primitivism where physical and conceptual borders of subjects were less apparent, Spectral Rite studies a mode of communication that extends beyond the autistic experiment of a mad person, not excluding immediate experiences of a possible community balancing between the institution, artists and viewers of different background. MULTI-ARTS PROJECT II Annyeong! Hello! 스펙트럼 의식은 국립현대미술관 서울관의 건축적 조건과 미술관의 환경에 시청각적으로 개입하는 관내 행진 퍼포먼스이다. 베를린 기반의 퍼포먼스 듀오인 하이에나즈는 스펙트럼 의식에서 일종의 아름다운 괴물, 양성구유, 이종교배물, 풍각쟁이, 약장수, 선녀와 신선이자 전사로 정의된다. 이들은 동양과 서양, 고대와 현대 그리고 미래를 두루 환기시키며, 친숙한 이방인으로서 서울관에 강림한다. 이 행진은 공적 장소로서의 미술관과 그 건축의 운명에 분석적으로 접근한 결과물이다. 또한 미래와 역사의 간극에 또 다른 시공을 개방하는 장소로서 미술관을 설정한다. 나아가 스펙트럼 의식은 제식 자체가 함축하는 원시성을 바탕으로, 현실인식에 기반한 이상주의의 상상적 시공간을 펼쳐놓는다. 이로써 미술관은 정치문화사회적으로 이질적인 구성원에 대한 신자유주의적 배타성이 전 지구를 잠식해가는 작금의 보수적 현실을 극복한 환대의 현장으로 거듭난다. 하이에나즈는 스펙트럼 의식을 위해 한국어로 쓰인 총 네 곡의 신곡을 선보인다. 행진은 서울관의 로비에서 시작해서 제1, 2 전시실, 서울박스를 거쳐 지하1층 로비, 미술관 마당 그리고 외부로 통하는 계단 등 각기 다른 지점을 거친다. 각 지점 사이를 이동할 때에는 다양한 움직임을 선보이며 노래된 말이 울려 퍼진다. 행진의 이동성을 극대화하기 위해 악기와 공연 장비는 어쿠스틱이나 디지털 방식으로 음향을 생성하는 발명품들로 대체되어, 기하학적인 의상 안에 장착된다. 이 유사 악기들은 주술적인 도구나 전쟁 무기, 미래적인 미디어 기계를 연상시키며 이미 존재하는 악기들을 흉내 낸다. 소리는 원시적인 미래, 언어 이면의 소리들을 시사하며 현재의 언어중심적 가치 체계와 번역의 불가능성을 극복한 순간을 그린다. 행위는 성별, 역사, 공간이 온전하게 결합한 새로운 혼종에 대한 갈망을 표현한다. 스펙트럼 의식을 통해 신체는 미술관의 건축과 결혼식을 올린다. 전사로서 하이에나즈는 소비로 점철된 도시의 권태로운 일상 및 안일한 제도에 저항한다. 스펙트럼 의식은 주체가 물리적이고 관념적으로 분화되기 전의 원시적인 감각을 도입하여 광인의 자폐증적인 실험을 넘어서고자 한다. 동시에 기관, 창작자, 관객의 존재 사이에서 줄타기하며 실험극으로서 가능한 소통의 방식과 공동체의 가능성을 모색한다.